1936 Pontiac Other in Sylvania, OH for sale. 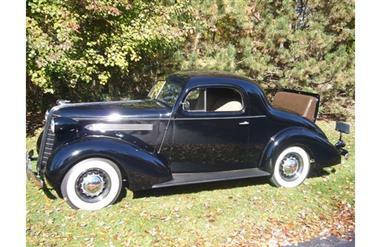 Pontiac Deluxe Sport Coupe. Wonderful 1936 Silver Streak Sport Coupe with rumble seat. Original unmolested and extremely clean aurtomobile with the desireable rumble seat and Waterfall grill. Original engine and interior. AACA Preservation Award winner. Older repaint in original black looks great. 77,000 original miles. Three speed on the floor. Underhood components all original and not repainted in any way so you can see the true honest components of this car. Original front suspension has just been gone thru with the original shocks professionally rebuilt. .This car starts and runs flawlessly, shifts and handles beautifully, and is a pleasure to drive. A great car.